Love Cannon is part of Walker and Bromwich’s Friendly Frontier Peace Campaign. A campaign that celebrates love through actions and environments, which lead participants towards an alternate world of love and Peace. This campaign takes place in the context of the current global political climate it seeks out love in a war torn world through bizarre and romantic acts. 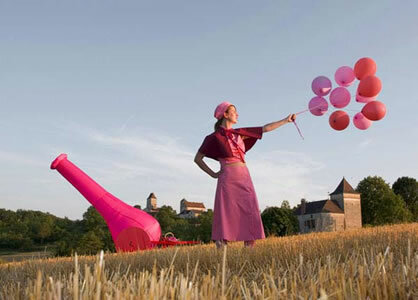 Love Cannon is a pink inflatable cannon, designed to shoot balloons into the skies in an action for peace. Each time the soft missiles are catapulted from the breach of this unlikely object the collaborative duo hope to spread a bit more joy in a world at war. The Cannon began its life in an idyllic tranquil village in France. The village of 'Les Arques' steeped in a medieval history of territorial battle still visible in its fortified architecture. It was this spot that spawned a Love weapon and inspired Walker and Bromwich to invite the village to join them in a wonderfully romantic gesture to the world. The people of Les Arques took this challenge to heart and became part of a utopian fete of sorts in a welcoming ceremony and parade. Since this inaugural event the love cannon has been fired at numerous locations across the UK the artists will continue to fire the cannon as often as possible while this symbolic antidote to war is necessary.